When the Nevada Athletic Commission voted unanimously in July to grant Vitor Belfort (pictured) a license after he tested positive for high levels of testosterone in February’s random drug test, one of the stipulations was Belfort agreeing to fully comply with surprise drug exams throughout his training camp in preparation for UFC middleweight champion Chris Weidman. However, three months passed and Belfort wasn’t tested once. NAC executive director Bob Bennett told MMAFighting.com that it was because the UFC informed him they had decided to move the Weidman-Belfort scrap from Nevada to California after Weidman was forced out of UFC 181 with a broken hand. Therefore, random drug testing would fall on the California State Athletic Commission. That explanation kinda made sense, but not to Weidman, who was baffled Belfort hadn’t been administered any pop quizzes in 90 days despite the fact his opponent had flunked two drug tests in Nevada for testosterone during his career. “wow! Thought he’s been getting tested countless times. Hasn’t been tested once since fight announcement 3 months ago! ?” Weidman posted on his verified Twitter account. Last Wednesday, the UFC officially announced Weidman would battle Belfort at UFC 184 in Los Angeles. Wanna hear something funny? Three days after that, guess who shows up to Belfort’s gym in Florida to demand urine and blood samples. The California State Athletic Commission, right? Wrong! According to Yahoo! Sports, it was Nevada’s people. Huh? But I thought Bennett’s excuse just 10 days ago for letting Belfort slide three months without a random drug test was because he was going to fight Weidman in California and it was no longer their responsibility? Bennett claims it was always his intention to test Belfort. If that’s the case, why do it three days after the fight was confirmed for Cali and not during the three months after promising to do so? It can’t be a financial thing, because Belfort is getting charged for all of the random drug tests that are coming his way. Bennett must follow Weidman on Twitter and finally realized he dropped the ball after seeing “All-American’s” perplexed tweet. CSAC executive officer Andy Foster has assured Bennett that they will randomly drug test Belfort up until his February 28 fight. 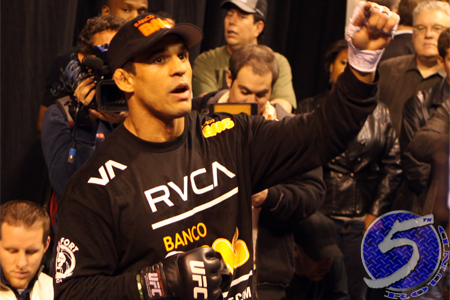 The results from Belfort’s latest drug screening won’t be known for approximately two weeks. However, the NAC failed Weidman miserably in not staying on top of Belfort.